that is nondegenerate in the sense that if we fix any two arguments to any nonzero values, the linear functional induced on the third vector space is nonzero. for which is the left and right unit. Since left or right multiplication by any nonzero element is an isomorphism, is actually a division algebra! Conversely, any division algebra gives a triality. It follows from Theorem 3 that trialities only occur in dimensions 1, 2, 4, or 8. This theorem is quite deep. By comparison, Hurwitz's classification of normed division algebras is easy to prove. Not surprisingly, these correspond to a special sort of triality, which we call a 'normed' triality. and such that for all there exists for which this bound is attained -- and similarly for cyclic permutations of . Given a normed triality, picking unit vectors in any two of the spaces allows us to identify all three spaces and get a normed division algebra. Conversely, any normed division algebra gives a normed triality. But where do normed trialities come from? They come from the theory of spinors! From Section 2.3, we already know that any -dimensional normed division algebra is a representation of , so it makes sense to look for normed trialities here. In fact, representations of give certain representations of , the double cover of the rotation group in dimensions. These are called 'spinors'. As we shall see, the relation between spinors and vectors gives a nice way to construct normed trialities in dimensions 1, 2, 4 and 8. To see how this works, first let be the group sitting inside that consists of all products of unit vectors in . This group is a double cover of the orthogonal group , where given any unit vector , we map both to the element of that reflects across the hyperplane perpendicular to . Since every element of is a product of reflections, this homomorphism is indeed onto. Next, let be the subgroup consisting of all elements that are a product of an even number of unit vectors in . An element of has determinant 1 iff it is the product of an even number of reflections, so just as is a double cover of , is a double cover of . Together with a French dirty joke which we shall not explain, this analogy is the origin of the terms ' ' and 'pinor'. consisting of all linear combinations of products of an even number of vectors in . Thus the irreps of restrict to representations of , which turn out to be still irreducible. These are called spinors -- but we warn the reader that this term is also used for many slight variations on this concept. and similarly for right-handed and left-handed spinors. In higher dimensions, the spinor representations become bigger than the vector representation, so we get no more trialities this way — and of course, none exist. are outer automorphisms of . In fact is the permutation group on 3 letters, and there exist outer automorphisms that have the effect of permuting the vector, left-handed spinor, and right-handed spinor representations any way one likes; and are among these. 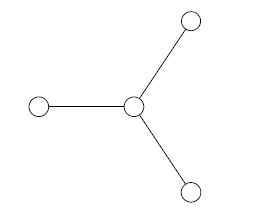 Here the three outer nodes correspond to the vector, left-handed spinor and right-handed spinor representations of , while the central node corresponds to the adjoint representation — that is, the representation of on its own Lie algebra, better known as . The outer automorphisms corresponding to the symmetries of this diagram were discovered in 1925 by Cartan , who called these symmetries triality. The more general notion of 'triality' we have been discussing here came later, and is apparently due to Adams . where the straight lines denote spinors and the wiggly one denotes a vector. The most familiar example is the process whereby an electron emits or absorbs a photon. It is fascinating that the same sort of mathematics can be used both to construct the normed division algebras and to describe the interaction between matter and forces. Could this be important for physics? One prima facie problem with this speculation is that physics uses spinors associated to Lorentz groups rather than rotation groups, due to the fact that spacetime has a Lorentzian rather than Euclidean metric. However, in Section 3.3 we describe a way around this problem. Just as octonions give the spinor representations of , pairs of octonions give the spinor representations of . 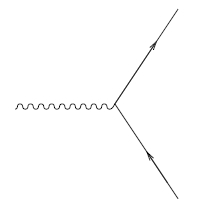 This is one reason so many theories of physics work best when spacetime is 10-dimensional! Examples include superstring theory [26,42], supersymmetric gauge theories [31,60,78], and Geoffrey Dixon's extension of the Standard Model based on the algebra , in which the 3 forces arise naturally from the three factors in this tensor product .